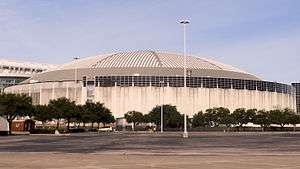 The 1992 National Convention of the Republican Party (GOP) of the United States was held in the Astrodome in Houston, Texas, from August 17 to August 20, 1992. 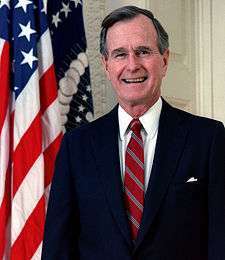 The convention nominated President George H. W. Bush, and Vice President Dan Quayle for reelection. It was the fourth consecutive appearance by Bush as a candidate on a major party ticket. Only Bush and Franklin D. Roosevelt have been nominated on four consecutive presidential tickets. Richard M. Nixon and Roosevelt were nominated five times, but not consecutively. "Whatever else history may say about me when I'm gone, I hope it will record that I appealed to your best hopes, not your worst fears, to your confidence rather than your doubts. My dream is that you will travel the road ahead with liberty's lamp guiding your steps and opportunity's arm steadying your way. My fondest hope for each one of you—and especially for the young people here—is that you will love your country, not for her power or wealth, but for her selflessness and her idealism. May each of you have the heart to conceive, the understanding to direct, and the hand to execute works that will make the world a little better for your having been here." As the economy was in a recession and domestic affairs in general had dramatically decayed, the GOP lagged in the polls by double digits to the Clinton-Gore team after a successful Democratic Convention, and with Ross Perot temporarily out of the race, the Republican Party worked hard to rally its base of social conservatives. Pat Buchanan's opening night "Culture War" speech argued that a great battle of values was taking place in the United States. Republican National Committee chairman Rich Bond (referring to Democrats) claimed that "we are America, they are not America". Marilyn Quayle dismissed Bill Clinton's claim to a new generation of leadership by saying, "Not everyone demonstrated, dropped out, took drugs, joined in the sexual revolution or dodged the draft." Regarding Buchanan's speech, liberal humorist Molly Ivins quipped that it "probably sounded better in the original German." Writing twenty years after the convention, the New York Times wrote, "Supporters of Mr. Bush pointed to the tone of the convention as one of the reasons he lost re-election that November to Bill Clinton. ", as it centered more on Reagan-era values and Bush's international credentials at a time that the main issue was the domestic crisis. The fact that the now-infamous "No new taxes" pledge had haunted the President for the last three years, the economy was barely mentioned. AIDS activist Mary Fisher, who has HIV, addressed the convention, making an eloquent plea for her cause. (She also addressed the 1996 RNC). Her 1992 speech was listed as #50 in American Rhetoric's Top 100 Speeches of the 20th Century (listed by rank). During his acceptance speech, President Bush thanked former President Richard Nixon for his advice and contributions to the administration's foreign policy. This would be Nixon's last RNC, as he died in 1994. The restaurateur Ninfa Laurenzo delivered the Pledge of Allegiance at the opening session on August 17, 1992. The stadium banned outside food from the convention, but set up a food court in the nearby Astroarena. The food court operations included Atchafalaya River Cafe, Bambolino's, Frenchy's, Luther's Bar-B-Q, Ninfa's, PeaColes, and Tommy's Burgers. Some restaurant owners had connections with the Houston Host Committee, the group in charge of the vendor market of the Astroarena, and Republican Party officials. The hot dogs and soft drinks sold by the Astrodome's official caterer, Harry M. Stevens, were not present during the convention. Vendors at the convention paid Stevens a fee so they could sell food at the convention, as specified in Stevens' contract with the Astrodome. The convention energized the Republican base, giving the Bush-Quayle ticket a bounce in the polls. As the bounce faded, the race returned to a lopsided double-digit Clinton-Gore lead. The race narrowed considerably, however, when Ross Perot rebooted his insurgent campaign. Because the Astrodome was their home stadium, the Houston Astros were forced to play 26 consecutive road games from July 27 through August 23. The National Football League's Houston Oilers would also be forced to play all their preseason games on the road. The major parties have avoided hosting their conventions at baseball stadiums since then, now holding them in non sports venues (such as Convention Centers) and venues for teams whose seasons are not currently in play at the time of the convention. Dan Quayle was renominated by voice vote. ↑ Kelly, Michael (August 20, 1992). "AIDS speech brings hush to crowd". New York Times. Retrieved October 10, 2011. ↑ Reed, Susan (February 5, 1996). "At Peace with the Past". People. 45 (5). Retrieved October 10, 2011. ↑ Michael E. Eidenmuller (2009-02-13). "Top 100 Speeches of the 20th Century by Rank". American Rhetoric. Retrieved 2015-10-27. ↑ Michael E. Eidenmuller (1992-08-19). "Mary Fisher - 1992 Republican National Convention Address ("A Whisper of Aids")". American Rhetoric. Retrieved 2015-10-27. ↑ Decker, Cathleen. "'92 REPUBLICAN CONVENTION : GOP Faithful Ponder if Party Will Unite Behind Bush : Election: Some see the convention as the jump-off point for a strong campaign. Others wonder if it's too little, too late." Los Angeles Times. August 17, 1992. 2. Retrieved on February 4, 2012. ↑ Staff. "Convention '92/Convention briefs." Houston Chronicle. Sunday August 9, 1992. A25. Retrieved on February 6, 2012. Patrick Buchanan's Address to the 1992 RNC, the "Culture War" speech. Text, audio and video. Mary Fisher's A Whisper of AIDS Speech to the 1992 Republican National Convention Text, audio and video.